Where will Newcastle United finish in the Premiership next season? [Poll] | NUFC Blog. Will he still be smiling this time next year? My esteemed colleague, Jimbob, has already taken a look back at the season past, you have already voted Fabricio Coloccini as our “Player of the Season,” but now it is time to look forward to next season. Being the hopelessly deluded, stereotypical Geordies that we are, Alan Pardew seems to think that our expectations will go into overload now that we have finished fifth, and that he needs to embark on a mission to “educate” us to lower our expectations now that a new European front has opened in Newcastle United’s war for supremacy. Well let’s find out how deluded we really are! Undoubtedly, we had a very good season. However, though we did well, perhaps our expectations have been just a little on the low side if anything. Our fifth placed finish wasn’t, perhaps, quite the miracle some have thought bearing in mind what Pardew had at his disposal. Bearing in mind previous catastrophes under the current regime though, it has been understandable that expectations have been lowered somewhat by experiences in recent years. On the other hand, if you look at the image showing the result of last year’s poll below, you will also see that it give the lie to the perennial whining of some fans that a large section of their fellows are just “doom mongers” who were confidently predicting our relegation at the start of the season. Only 4% predicted that, and some of those were voting from locations in the Wearside area! The great majority of you (60%) thought that we would be “Mid table battlers,” with the next highest (18%) correctly predicting that we would make the Europa League. The results from last year's poll. Please don’t get me wrong, I am not being dismissive of our fifth placed finish here by any means. As I wrote, we undoubtedly had a very good season leaguewise, if not in cup competitions. What I’m suggesting is that some of the foundations for our current success were already laid when Chris Hughton brought our current chief scout, Graham Carr, into the club in the latter part of our season in the Championship. At least some of our relative success so far has also been a testament to some excellent Carr influenced dealings in the transfer market, which now sees us with a highly competitive squad which should expect to battle it out with the likes of Everton for a solid seventh or eighth. Another example would have been Aston Villa, though their now departed manager made a bit of pig’s ear of their season and they were rather woeful underacheivers last term. How do YOU think we will do NEXT season? Depends on who we sell. If the media are in the know and telling the truth we’ll probably be playing a reserve team next season in all competitions. So far we’ve had Ba to Spurs, Krul to Chelsea, Cabaye and Tiote to Manure, Santon to Roma and Cisse to both Mancs. Looks like we may have John Carver at full back, Nile Ranger at striker, Beardsley at midfield, Stone on the wing and Woodman Sr. in goal. Well a kind of guessing game, chosing how well the club will do, not knowing what kindda squad we will be left with, or added to. In which case i dont see either a Championship league or even a europa league in our future. So guess it’s mid table battlers. I would imagine we will go for a cup win (any cup)which could get us into the Europa cup, even a sith is possible. But until the horses get to the starting gate, how do we handycap ? Hmmm !with just under 100 votes, there appears to be little difference between Midfield Battlers and Europa league hopefulls. This indicate moderate hopes, with of course the higher finish reflecting more hope than real belief IMO. Ah well, in general what i would call sensible choice’s. Way too early to tell Worky. But would be interesting to run this poll again at the seasons start and compare it to the results now. See who we sign, see who goes. Bit early for predictions mate no1 knows what the teams ganna be next season yet. Where’s the option for top of the league? I will be happy with a top 8 finish and a good run in the europa league and fa cup. I will settle for what Liverpool did this season. And we will not sack our Manager. BillytheFish – I’d gladly settle for that too. “Chelsea and Liverpool will not stand still next season” – exactly mate, I’ve been saying that since xmas. We finished a far better team than we started – better team work, fringe players came on strong and we made good signings. Then we made an incredible start and our confidence grew. 5th was an astonishing achievement – it silenced critics like me who still think our tactics are too basic, but I still think it has papered over cracks. We have been 3 players short of a very good squad for years – and we still are. And now we have another cup to play for. I think it is too much for us. Certainly chelski we pass us – but I also think spurs have peaked and may have a poor start. So the top 4 should be manc, manu, chelski & arsenal. but I fear that 3 cup runs may wear us down (despite the excitement) and see us slipping to 8th. 8th and a cup? yes, that will be success, I’ll happily settle for that. Supermac: I agree with everything you said. 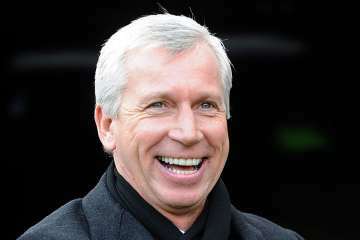 Apparently Pardew is having second thoughts about how the fcuk he can live up to last seasons finish. He has already warned the “overenthusiastic Geordies” not to set their standards too high, for the coming season. If we do finish lower than last year, with some expensive additions, can we then fire him Billy ? Just have to look at how Stoke and Fulham did in Europa both seemed to fall away in the premiership all got similar sized squads as us. See us finishing mid table but i thought we would be battling relegation last season so who knows.